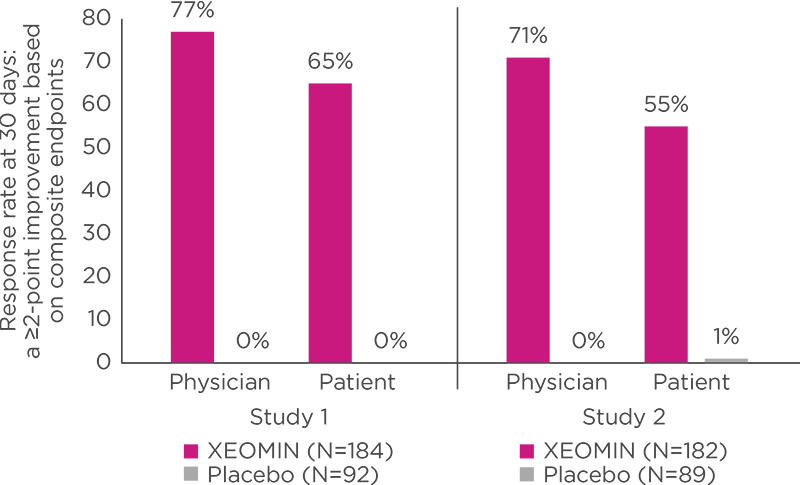 In 2 randomized, double-blind, multicenter clinical trials, XEOMIN was proven to temporarily improve the appearance of moderate to severe glabellar lines associated with corrugator and/or procerus muscle activity in adult patients.1-3 The most commonly observed adverse reaction incidence ≥2% of patients and greater than placebo) for XEOMIN was headache (5.4%). In a prospective, multicenter, randomized, double-blind, parallel trial, XEOMIN was randomized 1:1 vs another neurotoxin. The study enrolled 250 healthy female patients (≥18 years old) with glabellar lines of at least moderate severity at maximum frown. XEOMIN demonstrated comparable efficacy and duration up to four months. Patients were classified as responders only if they had a ≥1 point improvement from the baseline on the Facial Wrinkle Scale (FWS) at maximum frown, as assessed by the independent review panel using subject photographs at one month post treatment. Carruthers A, Carruthers J, Heinz M, et al. Multicentre, randomized phase III study of a single dose of incobotulinumtoxinA, free from complexing proteins, in the treatment of glabellar frown lines. Dermatol Surg. 2013;39:551-558. Hanke CW, Narins RS, Brandt F, et al. A randomized, placebo-controlled, double-blind phase III trial investigating the efficacy and safety of incobotulinumtoxinA in the treatment of glabellar frown lines using a stringent composite endpoint. Dermatol Surg. 2013;39(6):891-899. Data on File, Merz North America. Kane MA, Gold MH, Coleman WP, et al. A randomized, double-blind trial to investigate the equivalence of incobotulinumtoxinA and onabotulinumtoxinA for glabellar frown lines. Dermatol Surg. 2015;41(11):1319.